A promise had been kept! Infinix Hot 2 ( X510 aka The Hottest One) had finally gotten Android M 6.0 (Marshmallow) update and we will show you just how to install the latest update. Quickly flashing back to August 2015 when the device was launched into the market, we shared some review and unboxing photos of the smartphone. We all know this device was part of Google's Android One project, so many people had been anticipating this upgrade when Android M showed up in November last year, enough of the stories, let's go straight to why we are here. There are 2 ways to get this Android 6.0 upgrade on your Hot2 device. 2. Manual Install also called flashing. This update was rolled out via OTA as seen in the screenshot below but sadly, not every user had gotten it. If you can wait , OTA is much simpler, to get the update via OTA, ensure you update all your Google Apps at PlayStore. Secondly Go to your Settings >> About Phone >> System Updates and tap the "Check for update"
To hasten things up for the curious ones, follow the 2nd method below. 2. 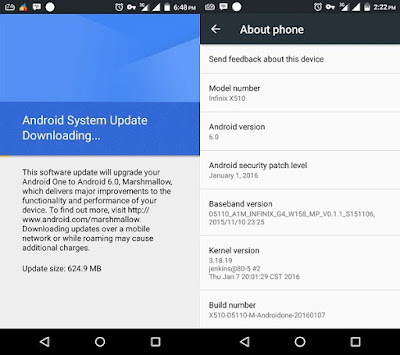 Manual Install or flashing Android Marshmallow on Infinix Hot 2. N.B - Please Note, like we'll always say, you're doing this at your own risk, We won't be held responsible for any brick, damage whatsoever mistakes made during the process of using these upgrade procedures, everything will go perfectly fine if well followed. Having agreed, you can proceed. Ensure your Hot 2 is Unrooted (KingRoot app can Unroot the device) and remember to have your Contacts and other stuffs backed up. We'll use Stock recovery method for flashing this time. Switch off your Infinix Hot 2, insert the memory card in it. Wait some seconds, it will prompt you "Apply to SD Card" use your Power button to select it and wait for some minutes till the rom finishes to install. When done, select reboot now. If you get "No command" after selecting recovery mode, press and hold power button + Volume up key again till it takes you back to recovery mode. That's all. It's quite easy after all eh? Leave us your comments if you have something to tell us, meanwhile enjoy the new Marshmallow update o your Infinix Hot 2. I love this phone; I just want something with a larger screen. In between choices right now. Thanks for the post. You're welcome. And by the way, there're are other similar ones, like Note 2 which is 6 inches. Or Zero 3 that is 5.5 inches, we have reviewed all of them here if you browse around to see. 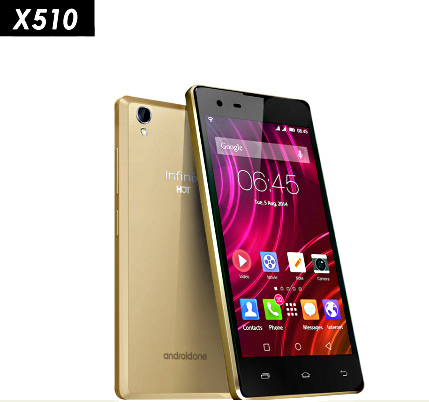 Difference is they are Not "Android One" like Hot2 but they may fit your expectations.